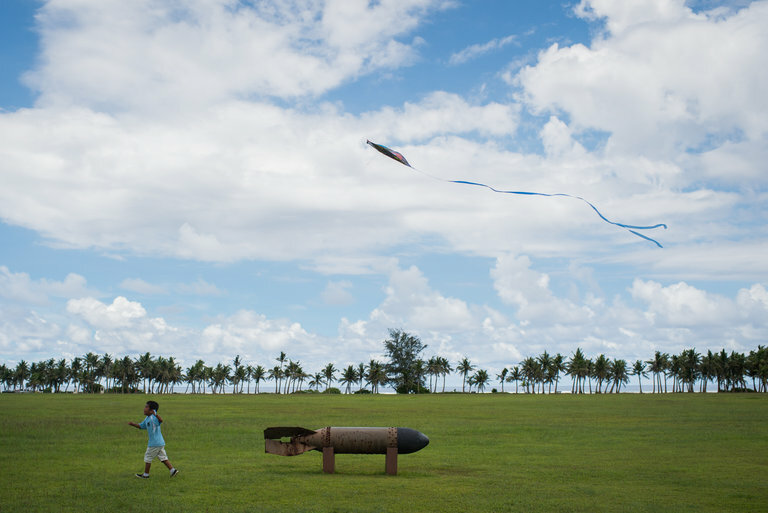 Guam, America’s Forgotten Front Line | "Global Possibilities"
A few days ago, North Korea said it was developing plans to fire four test missiles into waters near Guam. But some Americans seemed less alarmed by Kim Jong-un’s saber-rattling than surprised to learn that Guam, the small Pacific territory 4,000 miles west of Hawaii, is a part of the United States. The North Korea threat raises some basic questions for Guam. Should the Terminal High Altitude Area Defense system, B-2 stealth bombers and other military assets in Guam make its residents feel safer? Or is the large military presence why North Korea is singling out Guam in the first place? These questions highlight Guam’s often conflicted relationship with the military and underlying issues of democratic participation. If North Korea were to fire a missile at Guam, it would not be the first time the island has been attacked by a foreign power. On the same day Pearl Harbor was bombed, Guam was invaded by the Japanese. Military dependents were evacuated by the United States before the attack, but the indigenous people of Guam, the Chamorros, were not. A brutal three-year Japanese occupation resulted in more than 1,100 deaths, with thousands more Chamorros forced into labor camps. Day, commemorating the return of American troops on July 21, 1944. Yet the military presence on the island remains contentious. The military controls nearly a third of Guam’s land, including the largest sources of fresh water. A proposed relocation of thousands of Marines to Guam from the Japanese island of Okinawa would severely strain the territory’s infrastructure and threaten cultural heritage sites, while the economic benefits to Guam’s civilian community remain uncertain. Most Americans concerned about their country’s foreign policy or how military decisions affect their communities can call their senators or representatives when they want to influence federal policy. But because they are residents of a territory, the Americans who call Guam home (including one of this essay’s authors, Mr. Cruz) cannot vote for president and lack any voting representation in Congress. All Guam has is a nonvoting delegate in the House of Representatives. This seems particularly unfair since tiny Guam has a higher rate of military enlistment than any state. The result: a casualty rate in Iraq and Afghanistan for Guam that is four times the national average. But while up to one in eight residents of Guam are military veterans, Guam ranks dead last when it comes to per capita federal spending on medical care for veterans. However un-American it is to deny these citizens a say in Washington, there are no easy solutions. The most straightforward option may be a constitutional amendment giving residents of Guam and other territories the right to vote for president, as the 23rd Amendment did for residents of the District of Columbia. Statehood is an option, although Guam’s small population makes that seem unlikely. Independence is also a possibility, and while that’s still a minority view in Guam, support grows as federal concerns remain unresolved. So why hasn’t anything happened? Perhaps because of the myth that Guam and the other United States territories (American Samoa, Puerto Rico, the Northern Marianas and the Virgin Islands) lean left, so expanding their franchise would benefit Democrats. But the four million Americans who live in the five territories — a population greater than nearly half the states — are swing voters. Since 2002, Guam has elected a Republican governor and a nonvoting Democratic congresswoman; similar splits occur in the other territories. Neil Weare is the president of We the People Project, a nonprofit group seeking equal rights and representation in United States territories. Rodney Cruz is the president of Iraq, Afghanistan and Persian Gulf Veterans of the Pacific.